Leanban is a team-level framework that makes higher level Lean-Agile tenets actionable on a day-by-day basis. It guides process refinements using the most valuable lessons from Lean, Scrum, eXtreme Programming (XP), and Kanban. It requires a focus on business value, an organizational view, and a deep appreciation of empowered teams. The Agile world is partially based on Lean Thinking. Both Scrum and Kanban have implemented many of Lean’s principles with set practices – often with great success. Including more of a Lean perspective and incorporating other practices can lead to even more success. 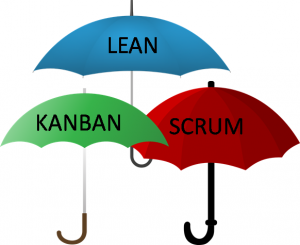 A Scrum or Kanban team can readily jump to Leanban, but that is not necessary. Scrum and Kanban teams can learn from each other and incorporate practices from each that work for them. The key is to investigate what works and why and then do that, and understanding Leanban can help. Leanban is the next step in the evolution of Agile in that it provides guidance to help Agile teams use Lean principles to select and use practices that best fit their situation and to change those practices when beneficial. It provides a consistent approach for delivering business value quickly and sustainably across the organization. For more information, see Leanban in Depth. To see how Leanban can help your Scrum team see Improve Scrum with Leanban. To see how Leanban can help your Kanban team see Improve Kanban with Leanban.